Two for one deals work in the supermarket, but I can’t offer the same on a training plan. There are no special workouts or shortcuts. Train, rest, repeat until race day; that’s all there is. Reviewing this blog’s stats I see search terms like ‘minimal Ironman training‘ or ‘easy Ironman training‘. I wonder if these people have made a smart choice? Minimal and easy are not words I associate with Ironman training. I appreciate there are many reasons and motivations to race. It is a personal choice. The race may not be for you if your first consideration is ‘how little can I do?‘ Ironman is a challenge, but there’s no obligation to race long. I have as much respect for those who sprint as those who spend the entire day racing. Sprints hurt. For many it’s about completion. The idea of competing, pushing the pace and challenging for positions is irrelevant. That’s fine. It reduces the pressure. Training only needs to ensure they can comfortable cover the distance before the cut off. Anything beyond that is a bonus. Competing is a different matter. It’s about efficiency, endurance and energetics. The faster you go the more work it will take. When you hear of an athlete who performed a great Ironman on little training ask about their past. They could be gifted or they could have a long history of training and racing already. Eliminate junk miles and you won’t need to do as much. Just quality training. I don’t like the term junk miles. The miles add up; they all contribute. The closest a mile comes to junk is when it wears you down; when it stops you performing the plan. 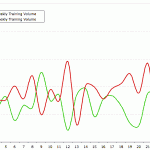 Volume isn’t junk inappropriate training is. A hard effort at the weekend that leaves you too tired to back it up with a good week: that’s junk. Drop the session plan and go easy when you’re feeling fresh: that’s low quality. High quality and junk free training is not about a particular volume or intensity it is about how you train. Sessions need to be relevant the less you do in training the more important that becomes. What is the absolute minimum you can do? It doesn’t require huge hours, but it does need consistency. You’re signing up for a long race, some workouts will be long too. I averaged twelve hours per week for my first Ironman. That number hides the peaks; a typical week involved ten to fifteen hours training. That wasn’t minimal. I would have completed on less. My brief athletic history consisted of a lot of running. I had the endurance and fitness to perform well at a marathon so could focus my efforts on swimming and cycling. It freed time; a huge contribution to performance off reduced training volume. 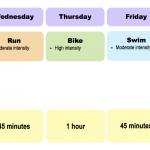 Depending on commitment and where you are in the season my simple Ironman training plan is between ten and twenty hours. Most athletes would spend between ten and fourteen hours training for the bulk of the year. It’s still not minimal (and certainly not easy). There’s an opportunity to save time by swimming less; manage without that tempo ride or run and shave off more. Two swims, two bikes and three runs a week should get you round. The lightest week around six hours, but you will need more. At some point you need longer bike rides and longer runs. Cutting hours won’t make training easier, if anything it adds pressure. Your athletic history may help: work on weaknesses and maintain strengths. There are no rules. Committing more time to training won’t guarantee better results. You can complete an Ironman on less training, but a minimalist approach comes with risks. Everyone’s time is limited and training inevitably compromised. It’s never about exactly how much or how hard you trained, but always about how appropriately you worked towards your goals. When I see athletes looking for an easier route or a minimal approach I just hope their expectations are realistic. I’ll admit a bias: I love to train. When I enter a race I don’t ask how little I can do, I ask how I can best use my available training time.